WHERE: 405 South Howard Ave.
WHAT: Heartbeat of Howard. 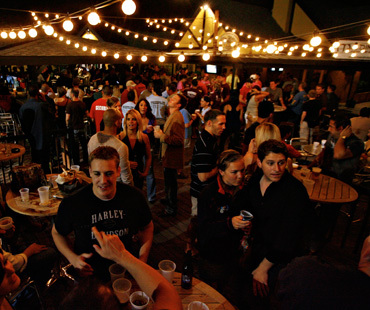 The best nights in SoHo either end or begin at this Irish Pub that is always one huge party with a dance floor, four outdoor bars, and live entertainment. WHEN (To Go): In Tampa, Happy Hour is synonymous with MacDintons. The Friday Crazy Happy Hour is always packed and for good reason. For two hours, all draft beers, house wines and well liquors (including Jack Daniels, Southern Comfort and Finlandi liquors) are all you can drink from 6pm – 8pm. Don’t feel intimidated by the long line that wraps around the block. Valet your car in MacDinton’s second lot at 509 S. Armenia and advance purchase your wrist band so you can walk right past the crowd. WHO (To Take With You): The friend that loves soccer. MacDinton’s airs all of the premier soccer games from around the world (Champions League, EPL, FA Cup & Europa Cup games) even it happens to be live at 7:45 am. WHY: Because you’ll probably run into someone you know. This place is always packed, so the odds are that if any of your acquaintances are out on the weekend, some of them are probably belly up to one of MacDinton’s seven bars.